The Cadillac Series 62 was introduced in 1940 and the third generation was introduced in 1948 (and was built through 1953). The cars were barely distinguishable from the down-market Series 61, but you tell them apart by their extra chrome and the fact that the Convertible was not available on the 61. But this is no ordinary Series 62. Nor is it any ordinary Cadillac. Only two bare chassis were sold by Cadillac in 1948 and both went to Saoutchik in France for dramatic coachbuilt bodies. This windswept design on this Three-Position Cabriolet is similar to Talbot-Lagos of the period. It is powered by a 5.7-liter V-8 making 150 horsepower. Not much is known about the early history of this car but it was restored in the 1990s and is beautiful, from the design to the colors. Just everything about it. Only two of these were built, and good luck getting your hands on the other one. It should bring between $1,000,000-$1,500,000. Click here for more info and here for more from Gooding & Company. 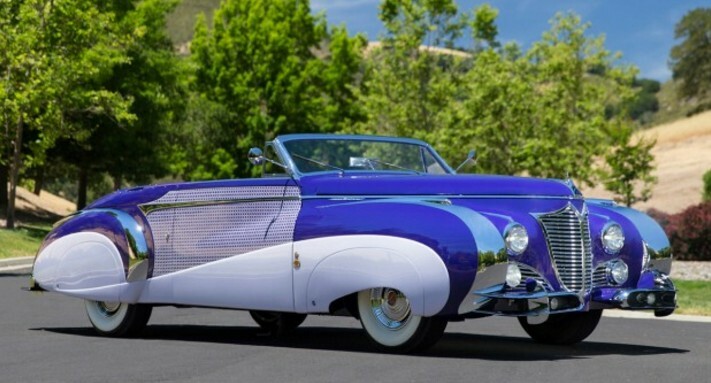 This entry was posted in Uncategorized and tagged 1948, auctions, cabriolet, cadillac, cars, classic cars, gooding & company, saoutchik, series 62, three-position by classiccarweekly. Bookmark the permalink.